Help Huggies and Walmart Assist Military Familes In Need! I’m a Huggies girl. Always have been, always will be. With both my boys Huggies were my diaper of choice and with Gavin they were the only diapers he ever wore. I tried all the other generic and brand names when Johnny was little and Huggies were the only brand that left his bottom dry and protected without leaking! I didn’t think twice about making them the only choice for Gavin and for this little boy on the way I’ll be doing the same. Huggies are tried and true for our family so why mess with that! Huggies and Walmart are partnering with Operation Homefront to help military families in need and are asking for YOUR help! By visiting www.huggiescamo.com, bloggers and readers can submit Camo Cards as well as purchase HUGGIES® Limited Edition Camo Diapers to help provide diapers for military families in need as well as funding to Operation Homefront. · Visit the site and Create a Camo Card (a post card expressing your appreciation to those who serve). 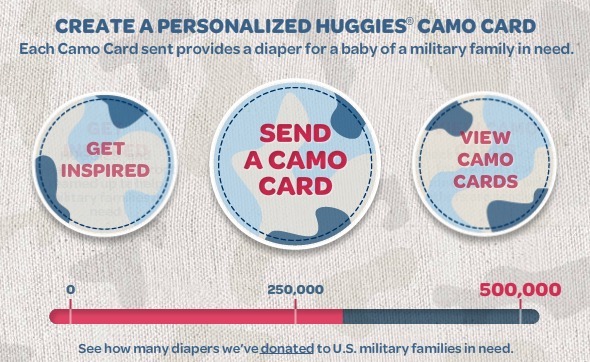 o For every Camo Card created, Huggies will donate a diaper to a military family. Each submission also goes towards our ultimate goal of 500,000 diapers donated! · Purchase Huggies® Limited Edition Camp Diapers available at Walmart. o For every purchase, Huggies will donate to Operation Homefront, which provides emergency assistance to the families of service members and wounded warriors. 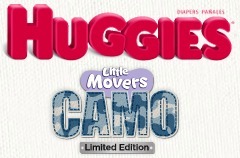 So head on over to your local Walmart and make sure to grab a box of camo diapers from Huggies now! They are only available in sizes 3 and up but if you are like me you are going to be buying Huggies anyways so why not help our military at the same time! Let’s help make sure that Huggies reaches their goal of ultimate goal of 500,000 diapers! This is a great design and program for paying it forward. Very cool….that we can do something so small that can make such a difference.